RadBusyIndicator exposes a BusyContentTemplate property which allows you to customize the DataTemplate shown while the indicator is in Busy state. In this section we will show you how to create and apply a simple BusyContentTemplate to your RadBusyIndicator control. For the purpose of this example we will create a DispatcherTimer timer and while this timer is on, the RadBusyIndicator will also be active. To start the timer the user will have to click on a button. The example also includes a counter representing the progress value which will count down from 100 to 0 percent and will be visible through the RadBusyIndicator's busy content. Notice that the RadBusyIndicator's Background property is set to Transparent. 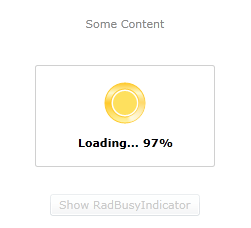 This will be the background applied to the indicator's content and the Grid hosting the RadBusyIndicator's progress bar and content elements. Create and initialize the DispathcherTimer object. Enable the RadBusyIndicator by setting its IsBusy property to True. Start the timer that will count down some period of time. Modify the counter (progress) property. Disable the RadBusyIndicator by setting its IsBusy property to False in a specific condition. You can also create a determined RadBusyIndicator control which provides a straightforward way to report a changing progress value.